The Bureau of Labor Statistics reports that graduate degree holders have higher employment rates than those with only a bachelor's degree. Earning a master's in ESL is a great way to increase your salary as an English language instructor, and to qualify for more diverse and lucrative job opportunities. With the number of English language learning students on the rise in the United States, the need for qualified instructors is also growing, making right now an ideal time to begin a TESOL master's program. Most ESL master's degree programs will offer slightly different courses and they may have different graduation requirements. These programs are not identical, and you will want to consider your own academic and professional goals to decide which type of program best suits you. For example, some programs offer the opportunity to pursue a concentration like multiculturalism. Pursuing a concentration will specialize your degree, may prolong your time-to-completion, and could impact the types of careers you consider after graduation. Despite their differences, all of these accredited online programs prepare you to effectively teach English to English language learners. TESOL master's programs cover several important topics, including second language acquisition, theories in language practice, language instruction, and research. Some programs also require fieldwork, a thesis project, or an internship to graduate. As you search for the right school to complete your degree, consider how these different requirements fit into your educational and vocational goals. University of Northern Iowa ranks #1 on The 25 Best Online Master's in English Language Learning Degree Programs! The University of Northern Iowa offers one of the best master's in ESL programs in the country. Students pursuing UNI's master's of arts in teaching English as a second language (TESOL) complete required courses in a specific sequence; degree seekers should keep in contact with advisors to ensure their progress meets the department's expectations. Once matriculated, distance learners can complete the program through thesis or non-thesis options. The number of mandated hours vary depending on the format: 33 hours for the non-thesis track and 39 hours with a thesis. Regardless of their path, students must also complete a final examination. Some classes included in the curriculum count towards the Iowa English as a second language (ESL) endorsement. To enter the program, students must have a GPA of 3.0 or higher, although the school may accept some students with a GPA between 2.75 and 2.99. Additionally, any student who does not speak English as their native language needs to take the TOEFL exam. The university also allows some transfer credits, if they receive approval from the department. UNI delivers courses through a number of virtual formats, including Adobe Connect and Blackboard, creating a solid platform that supports academic success. Additionally, tuition at UNI is the same for all students, no matter their state of residence. Qualifying distance learners can also apply for financial aid. University of North Dakota ranks #2 on The 25 Best Online Master's in English Language Learning Degree Programs! The University of North Dakota offers an academic track similar to a standard ESL master's program; however, its degree is called a master's of education in English language learner (ELL) education. Regardless of the name variation, the Council of Accreditation for Educator Preparation (CAEP) recognizes that this program, and the included coursework, adheres to standards set by the International TESOL Association. Through virtual classrooms, students study coursework, complete exams, listen to lectures, and interact with fellow students. Students can focus on general ELL or specialize in rural ELL/ESL education. The university also hosts an optional live seminar related to TESOL each semester, either on the UND campus or in conjunction with a TESOL conference in the region. UND encourages, but does not require, all learners to participate in these opportunities. For acceptance into the program, candidates need an overall undergraduate GPA of 2.75 or a 3.0 GPA over their final two years. Up to 25% of the necessary credits for this program may be transferred from another school. Once accepted, students complete 35 credits of coursework and 90 hours of a practicum based in a K-12 classroom. The site for this practicum can be near the degree seeker's home. Instead of a thesis, learners complete an independent study or a final project, which must be approved by the department. Each final project or independent study must reflect the ideas and experiences gained during the student's time in the program. Asbury University ranks #3 on The 25 Best Online Master's in English Language Learning Degree Programs! Asbury University, located in Wilmore, Kentucky, offers an ESL master's program online in the form of a master's of arts in teaching in English as a second language P-12. Admission requirements for this program include a teaching license, a minimum GPA of 2.75, and successful completion of all relevant PRAXIS exams; however, the GRE can replace the CASE PRAXIS test. Students with a native language other than English must also provide evidence of taking the TOEFL exam with a score of 550 or higher on the paper-based test or 80 or higher on the internet-based test. In addition to these exam and language restrictions, the department interviews potential students prior to admission. All candidates must also submit the character and fitness form issued by EchoSign. This program consists of between 47 and 51 credit hours, including a research project. Students take these courses by completing live meetings and clinicals. For clinicals, the school provides learners with a choice between traditional clinicals or “Option 6,” the latter of which permits students to work as provisional teachers while fulfilling field requirements. In addition to clinicals, required core classes include intro to TESL, research development, and sound systems of language. The university also provides a master's of arts in English as a second language P-12 endorsement, which only calls for 36 credit hours. The New School ranks #4 on The 25 Best Online Master's in English Language Learning Degree Programs! The New School offers an online TESOL master's program. Distance learners pursuing this degree choose from two areas of concentration: teaching or curriculum development. A student's emphasis affects both the application process and the courses they take. In addition to the standard application requirements of transcripts, letters of recommendation, a statement of purpose, an interview, and a resume, applicants who want to join the TESOL curriculum development program must also submit proof of ELT certification, a lesson plan, and a short essay. Additionally, students in this track must have previous experience teaching ESL or EFL for a specified amount of time and hold The New School certificate in teaching English (or an acceptable substitute). While students in both concentrations complete the same core classes, including English in the world and principles of language learning and teaching, the other half of a program's classes are concentration-specific, such as learner assessment (curriculum development track) and methods and materials: skills (teaching). Both branches of the program require students to complete 30 credits. Students can also choose to study in New York over the summer, enabling them to earn a master's degree within one year. This summer intensive provides housing for interested students and affords learners the opportunity to earn as many as 12 credit hours over an eight-week period. Webster University ranks #5 on The 25 Best Online Master's in English Language Learning Degree Programs! Students can earn an online TESOL master's degree at Webster University by pursuing one of two areas of study. One option features a K-12 ELL education emphasis, where distance learners with teaching experience develop and build on their ELL skills. The other specialization follows an adult education emphasis; unlike the ELL track, this option does not require a teaching license. Students pursuing either concentration must successfully complete 33 credits to earn their degree. Webster also offers a combined undergraduate/graduate degree program; students earn teacher certification in elementary education at the end of their BA program and then become eligible for certification in ESOL upon completion of their MA in TESOL. Both program tracks introduce students to a number of language-relevant concepts, helping them become better teachers of the English language. Courses incorporate concepts like syntax, dialects, and theories, providing a thorough examination of the language and how to relate language concepts to new learners. Distance learners access coursework by taking advantage of several technological tools, including blogs, electronic classrooms, and video and audio files. Students applying to pursue either concentration need an undergraduate GPA of at least 2.5. They must also submit a teaching philosophy statement in addition to their transcripts. Applicants whose first language is not English need to score at least 575 on the TOEFL exam. Additionally, for applicants with English as their first language, the school prefers individuals who have experience with at least one other language. Kennesaw State University ranks #6 on The 25 Best Online Master's in English Language Learning Degree Programs! Kennesaw State University offers an ESL master's online program in the form of an MEd in TESOL. Students complete 36 credits and can typically graduate in two years or fewer. Required coursework features cultural issues for ESOL teachers, applied linguistics for ESOL teachers, and assessment of English language learners. Delivery methods for classes vary depending on the professor, but classes may be offered synchronously or asynchronously. Learners enroll in courses throughout the fall, spring, and summer terms. Students also complete a TESOL internship where they gain on-site experience; the department allows distance learners to complete this internship at their current workplaces. Furthermore, after only two semesters in the program, students earn an ESOL endorsement. This degree comes with accreditation from the National Council for Accreditation of Teacher Education (NCATE) and the Council for Accreditation of Educator Preparation (CAEP). The Georgia Professional Standards Commission also affords endorsement to this TESOL program. For admission into the program, a student must hold a teaching certification. Other requirements for entrance include a personal statement, resume, and letters of recommendation. In some cases, the department also requires the applicant to complete an interview; this can be conducted over the phone, in person, or on Skype. The school's listed application deadline falls on July 1st. Sam Houston State University ranks #7 on The 25 Best Online Master's in English Language Learning Degree Programs! Interested students can pursue an advanced TESOL degree at Sam Houston State University in Huntsville, Texas by enrolling in the school's master's of education in TESOL program. Participants become better equipped to use technology, theories, and linguistic foundations to help ESL learners attain a strong grasp of the English language. Graduates of this program can also conduct research in the fields of second language learning and teaching and evaluate informal and formal assessments for ELLs. This degree is only available online. During the program, students complete 30 credits of courses. These consist of four core classes, including second language acquisition and development and applied linguistics in ESL/EFL settings, as well as six elective classes that can be used to tailor a degree to better fit a student's interests. Elective coursework includes English for specific purposes, gaming and literacy, and survey of reading. While pursuing this master's degree, students also obtain a certificate in second language instruction. Additionally, new students taking all of their classes online can apply for special $1,000 scholarships towards their education. The program's admission requirements include submitting an application, application fee, transcripts, two letters of recommendation, and a writing sample. The university boasts NCATE accreditation, which it has held since 1954. Concordia University-Nebraska ranks #8 on The 25 Best Online Master's in English Language Learning Degree Programs! Concordia University affords students the opportunity to participate in one of two master's in ESL programs: a master's of education in curriculum & instruction with an ESL/ELL emphasis and a master's of education in literacy with reading specialist and ESL emphases. Both of these programs can be completed online. For the curriculum & instruction emphasis, students complete 39 credit hours that are divided into 13, eight-week courses. These courses include empowering teachers as leaders and ESL/ELL instruction. Required credits exist in three categories: 21 hours focus on teaching, 12 hours concentrate on ESL/ELL (which matches Nebraska's ESL/ELL certification details), and six hours are reserved for capstone projects. One capstone requirement relates to curriculum and instruction, while the other focuses specifically on ESL/TESOL. When working on the curriculum and instruction project, learners discuss concepts presented by The Interstate New Teacher Assessment and Support Consortium (INTASC), while the ESL/ELL project focuses on a student's learning experiences in the classroom and in the field. Alternatively, for the literacy emphasis, students complete 51 credit hours in the form of 17, eight-week courses. These include reading in middle and secondary schools and teaching writing in grades PK-12. This option prepares graduates to work with students at primary and secondary schools. This program also includes the aforementioned ESL/TESOL capstone project. Azusa Pacific University ranks #9 on The 25 Best Online Master's in English Language Learning Degree Programs! Azusa Pacific University, located in Southern California, offers a master's degree in TESOL. This WSCUC-accredited school hosts its master's of arts in teaching English to speakers of other languages program entirely online. This program follows a four-session format: Fall I, Fall II, Spring I, and Spring II. Full-time students typically take two courses per session and complete the program in approximately six sessions (18 months). The program consists of 33 units and includes both concrete requirements, like second-language acquisition and teaching English grammar, and elective coursework, including language learning through technology, critical perspectives on Christianity, and English language teaching. However, learners pursuing this online degree should be careful when making these choices; not all elective courses exist in an online format. Although this program features sequential courses in a cohort model, which builds a sense of community, courses are scheduled asynchronously. Admissions requirements vary for domestic and international students. For domestic degree candidates, the school suggests a minimum GPA of 3.0, although the department might consider students with a slightly lower GPA on a temporary basis. Students who do not speak English as their first language must score at least 600 on the TOEFL exam. Other requirements include a statement of purpose, resume, and letters of recommendation. International students must also provide a passport and further financial information. Canisius College ranks #10 on The 25 Best Online Master's in English Language Learning Degree Programs! Canisius College offers a TESOL master's degree that provides students with the credentials needed to obtain New York State certification as pre-college educators in the field. This master's of science in teaching English to speakers of other languages requires 30 credits and includes a combination of core requirements (e.g., cultural perspectives in multilingual education and research in reading) and degree-related electives (e.g., methods of teaching the subject areas in the native language and emergent literacy). The college also provides other options for language-based education beyond the master's program. These additional offerings include an advanced certificate in TESOL education, which calls for the completion of 18 credits, and an online bilingual education extension, which consists of 15 credits. The advanced certificate program and bilingual extension can be completed in as little as one year. For admission into the master's program, the school prefers students with a GPA of at least 3.0, although the department sometimes considers applicants with a lower GPA. Eligible degree candidates must also hold a teaching license, or be pursuing such certification, and have proof of successful fulfillment of 12 credits of courses in a language beyond English. Up to six applicable credits can be transferred into this program from another institution if a student completed the coursework within the last five years and earned a “B” or higher. University of Maryland-Baltimore County ranks among The 25 Best Online Master's in English Language Learning Degree Programs! The University of Maryland - Baltimore County offers a master's of arts in teaching English to speakers of other languages program that features four different options. Students may complete these programs either online or face-to-face. First, the university offers the general format (Option 1), which focuses on basic courses of study. These classes include concrete requirements, including cross-cultural communication for ESOL, as well as electives and a required internship. Students who select Option 1 must complete 36 hours of study. Option 2 features a thesis. This track is similar to Option 1; however, students complete a thesis project in place of an internship. This option requires 39 credits. Option 3 leads to K-12 certification in the field. This 42-credit focus requires all of the classes from Option 1 in addition to coursework in ESOL testing and evaluation. Students pursuing this route also complete a 100-day internship in a school setting. Finally, Option 4 represents the most demanding of the choices; this path includes a thesis project and certification. To complete this alternative, students take a total of 51 credits. All of these tracks provide students with a strong theoretical and practical foundation in applied linguistics, language acquisition, ESL/EFL methods, testing, cross-cultural studies, and curriculum development. This program offers rolling admissions and students can apply three times throughout the year. Applicants who miss admission deadlines may take up to two courses in the program as non-degree students if they obtain permission from the program director. 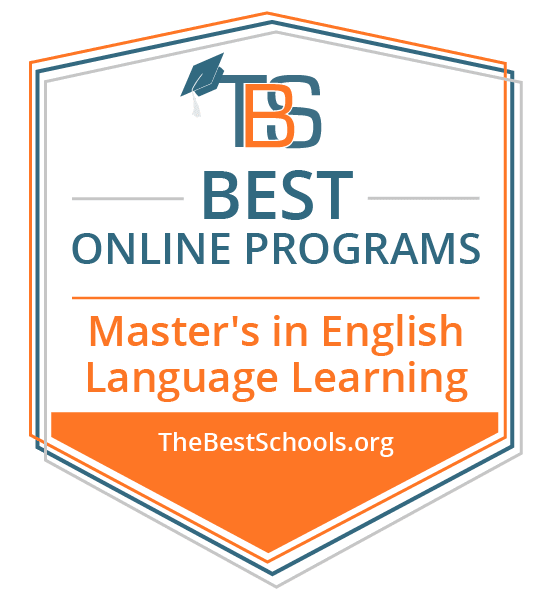 Biola University ranks among The 25 Best Online Master's in English Language Learning Degree Programs! Biola University is a Christian institution that offers a WSCUC-accredited TESOL master's program online. Students complete 36 hours of coursework to earn this degree. The curriculum consists of 24 credits of major-related classes, such as structure of English and second language acquisition, with most of the remaining hours going toward elective courses on TESOL topics. Additionally, due to Biola's faith-based nature, all students must complete a course in Christian theology. Degree seekers enroll in courses during the spring, summer, and fall terms. Classes are delivered asynchronously, allowing students to log on at their convenience to complete assignments. Full-time students can expect to finish this degree within four semesters, whereas part-time students should finish within eight. To graduate, learners must submit a portfolio, earn a “B” or higher in all TESOL courses, and finish with an overall GPA of at least 3.0. Transfer applicants should note that the program requires degree seekers to complete at least 24 of the required hours at Biola University. For admission into this program, students who do not speak English as their first language must score well on the TOEFL exam and participate in an interview. All degree candidates, regardless of their native language, must complete a writing proficiency exam to determine their writing abilities. Greenville University ranks among The 25 Best Online Master's in English Language Learning Degree Programs! Students can earn a TESOL master's degree through Greenville College, which ranks as one of the best online schools in the state of Illinois. The college's master's of arts in teaching English to speakers of other languages program consists of 31 credits and takes approximately two years to complete. Required coursework includes linguistics for TESL, theoretical foundations for TESL, and graduate studies in education. Students finish the program by completing a capstone project. For this capstone, students use the knowledge and experience they gained throughout the program to write a proposal to improve an actual school district. Students who already hold an Illinois teaching license can complete 100 hours of field experience to meet Illinois State Board of Education requirements for ESL approval/endorsement. Admission requirements for this program include transcripts and an educational philosophy statement. Applicants with teaching certifications also need to submit copies of those documents. Unlike some schools, Greenville College does not insist that applicants already hold a teaching license if they choose to follow the non-endorsement route; however, this program does not serve as an initial licensure program. The school also offers degree candidates who previously attained a degree through the college the opportunity to apply for financial assistance through the Alumni Award Scholarship, in addition to other financial aid options. Western Governors University ranks among The 25 Best Online Master's in English Language Learning Degree Programs! Located in Salt Lake City, Utah, Western Governors University offers a fully-online master of arts in English language learning (PreK-12). Designed for licensed teachers seeking an ELL or ESL credential, this master's in ESL program emphasizes competency over credit. Incoming students with a strong foundation in ESL may complete their studies in as little as six months, and most graduate within 20 months. Depending on state licensing regulations, the program may lead to an ELL or ESL endorsement. Master's students are permitted to design their own personalized degree plans around a series of required courses. Typically delivered in a synchronous format, these courses include language production, theory, and acquisition, assessment theory and practice, planning, implementing, and managing instruction, and research foundations. Prior to graduation, distance learners must complete a capstone project. Working in partnership with local elementary and secondary schools, students spend at least 15 hours observing classroom operations. Students also demonstrate their cumulative knowledge through a teacher work sample, in which they design an original curriculum unit to meet a specific educational need. WGU tuition policies are somewhat different from those of most colleges. Instead of paying per credit, WGU students pay a flat six-month term fee. Students may take as many classes as they desire during a term. MA program applicants must hold a valid teaching license and a bachelor's degree from an accredited university. Prospective students should submit their official undergraduate transcripts along with an application, and may be required to complete an interview with an enrollment counselor. WGU is accredited by the Northwest Commission on Colleges and Universities. Hamline University ranks among The 25 Best Online Master's in English Language Learning Degree Programs! Hamline University offers both a master of arts in teaching English to speakers of other languages (TESOL) and a master of arts in English as a second language. Students residing in eligible states may enroll in the university's fully-online master's in TESOL and ESL programs. The TESOL master's program prepares graduates for careers working with adult learners. Hamline's TESOL master's degree curriculum includes 34 credit hours of coursework, including studies in second language acquisition, English teaching practices, and applied linguistics. With no capstone requirement, many students earn their TESOL master's degree in just 20 months. Students concentrating in adult ESL or K-12 licensure complete 29 credits of required coursework, earning their ESL master's degree in approximately 24 months. Topics examined include the history of English, second language acquisition, and research methodology. In addition to core coursework, distance learners must complete 11 to 19 credits of specialized work. All graduates must complete a capstone project or thesis. Prospective Hamline students should provide their official transcripts, demonstrating a minimum undergraduate GPA of 3.0 and bachelor's degree from an accredited university, two letters of recommendation, and, depending on the program, either a statement of purpose or academic paper. Hamline offers a 10% tuition discount for alumni, and accepts some transfer credits from accredited graduate programs. Based in Saint Paul, Minnesota, Hamline and its School of Education are accredited by the Higher Learning Commission and the National Council for the Accreditation of Teacher Education. Buena Vista University ranks among The 25 Best Online Master's in English Language Learning Degree Programs! Located in Storm Lake, Iowa, Buena Vista University offers a fully-online master of education in teacher leadership, curriculum, and design with an emphasis in teaching English as a second language. BVU's 31-credit ESL master's degree requires nine credit hours of core coursework in classroom leadership, curriculum, and design, and an additional 22 ESL credits. Topics addressed include second language acquisition for classroom teachers, applied linguistics, and methods and curriculum development in TESL. Graduates must complete an ESL teaching practicum at the K-6 or 7-12 level, as well as a capstone portfolio. Unlike many ESL master's programs online, BVU's curriculum focuses exclusively on teaching English as a second language at the K-12 level. Designed for current teachers, the program emphasizes second language acquisition while strengthening teaching skills and assessment techniques. Applicants must hold a bachelor's degree from an accredited institution with a minimum 2.75 undergraduate GPA, and a valid K-12 teaching certificate or license. They should also submit three letters of recommendation. Classes start every eight weeks, and students may apply for admission at any time. Buena Vista University is accredited by the Higher Learning Commission, and its School of Education has conditional accreditation from the Iowa Department of Education. Spring Arbor University ranks among The 25 Best Online Master's in English Language Learning Degree Programs! Spring Arbor University's web-based master of arts in teaching English to speakers of other languages differs from many TESOL master's programs, in that it offers academic tracks for both certified K-12 teachers and professionals focusing on adolescent or adult education. Licensed teachers who complete the master of arts in TESOL program will earn an ESL endorsement, while the adolescent and adult education track prepares graduates to teach in foreign countries. Spring Arbor University operates on a semester schedule. Consisting of 33 credit hours, the master's curriculum includes 30 credits of core coursework, 21 of which are identical for both tracks. Students pursuing the K-12 concentration explore linguistics, cross-cultural communication, and teaching methods, while the adolescent and adult education track includes coursework on teaching writing, methods of second language acquisition, and assessment and evaluation. Both tracks require a capstone project, with adolescent and adult education students completing a field experience and a practicum for the K-12 track. Applicants to both master's in TESOL tracks face the same admissions requirements, and must hold a bachelor's degree from an accredited institution, with a cumulative GPA of 3.0 preferred for the final two years. In addition to official transcripts, applicants should provide contact information for two references and a writing sample. Those pursuing the K-12 track must submit a copy of their teaching certificate. SAU is affiliated with the Free Methodist Church, and accredited by the Higher Learning Commission. McDaniel College ranks among The 25 Best Online Master's in English Language Learning Degree Programs! Founded in 1867 and located in Westminster, Maryland, McDaniel College offers an online master of science in teaching English to speakers of other languages. Approved by the Maryland Higher Education Commission in 2007, this TESOL master's program prepares graduates to teach English as a second language at all grade levels. This 36-credit TESOL master's degree covers the fundamentals of English learner education, assessment of English learners, grammar for ESOL teachers, and research methodology. Elective courses include bilingual special education and issues in inclusive education. Prior to graduation, students must hold a minimum cumulative GPA of 3.0, and complete either a three-credit TESOL portfolio or written thesis. While local students may pursue hybrid or in-person electives, the degree can be completed entirely online. McDaniel College operates on a semester schedule. TESOL program graduates pursue careers as ESL teachers, foreign language instructors, or work in public and private sector jobs involving speakers of other languages. While the program does not grant teaching certifications, previously-certified teachers may qualify for an ESL endorsement. Applicants to McDaniel's TESOL program should submit official transcripts showing a bachelor's degree from an accredited institution and a minimum 2.75 GPA, a statement of intent describing the applicant's academic and career goals, and three letters of recommendation. Some students may need to complete prerequisite coursework, such as six credits of a modern foreign language, before enrolling. The university is accredited by the Commission on Higher Education of the Middle States Association of Colleges and Schools. Emporia State University ranks among The 25 Best Online Master's in English Language Learning Degree Programs! Located in Emporia, Kansas, ESU was established in 1863 as the state's first educator training school. Today, the university offers a web-based master of arts in teaching English to speakers of other languages. ESU's TESOL program prepares students to teach at the secondary level, and graduates may qualify for a Kansas teaching license. The TESOL master's degree curriculum consists of 36 credit hours, 21 of which are core courses such as linguistics for language teachers, cross-cultural communications, and teaching ESL. Students must also complete 12 to 15 credits of elective coursework on topics that include sociolinguistics, computer-assisted language learning, rhetoric, or reading curriculum development, as well as a six-credit thesis. Like many online TESOL master's programs, ESU's curriculum includes a practicum component. Offering practical, hands-on field experience, online students typically complete their practicum at a nearby school. TESOL program applicants should submit official transcripts demonstrating their completion of a bachelor's degree from an accredited university with a minimum 2.75 GPA for the last 60 credit hours, three letters of recommendation, a resume, an essay describing the applicant's career goals, and an admissions essay on a topic chosen by the program. Kansas residents pay in-state tuition. The university is accredited by the Higher Learning Commission, and the Teacher's College is also accredited by the National Council for Accreditation of Teacher Education and the Kansas State Department of Education. Murray State University ranks among The 25 Best Online Master's in English Language Learning Degree Programs! This Kentucky university offers a fully-online master of arts in teaching English to speakers of other languages. Unlike many online TESOL master's programs, Murray State's part-time TESOL degree is designed for working professionals, allowing graduate students to work as they complete the program. Students can begin their studies at the start of any semester, and most graduate within 24 to 36 months. Murray State's online master's degree requires 33 credits of coursework in areas such as teaching ESL writing, course and syllabus design in ESL, and applied linguistics. While all students must complete both a practicum and internship, paid work may fulfill the internship component. TESOL program graduates go on to teach ESL in secondary schools, private companies, and pre-college English programs at community colleges and universities. Applicants to the TESOL program must hold an undergraduate degree in English or a modern foreign language, or receive approval from the TESOL Advisory Committee. They must also demonstrate proficiency in a foreign language by completing 12 credit hours of language coursework. Non-native English speakers may be required to demonstrate proficiency in English. In-state and out-of-state students pay the same tuition. Murray State has been accredited by the Southern Association of Colleges and Schools Commission on Colleges since 1928. Eastern University ranks among The 25 Best Online Master's in English Language Learning Degree Programs! Eastern University is a Christian school located in the Philadelphia suburb of St. Davids. Eastern accepts applicants to its online TESOL program in August, January, May, and June. This online master of education in teaching English to speakers of other languages is entirely web based, and can be completed in as little as one year. Eastern's 30-credit TESOL master's program covers topics in multicultural education, language testing and materials development, and education in a global context. Students must also complete 10 hours of fieldwork, which is typically done at a local institution, as well as a research-based thesis or teaching-based project capstone. Additionally, the university offers a four-week summer program for international students. Applicants must provide official transcripts demonstrating completion of a bachelor's degree, a current resume, and a statement of purpose. Non-native English speakers should meet the required minimum TOEFL scores. Incoming graduate students can transfer up to nine graduate-level credits, provided that they were earned through an accredited program within the last seven years and resulted in a grade of B or above. Veteran applicants may receive tuition benefits through the Troops to Teacher program. Founded in 1925, Eastern University is accredited by the Middle States Commission on Higher Education. Newman University ranks among The 25 Best Online Master's in English Language Learning Degree Programs! This Wichita, Kansas university offers an online master of science in education in curriculum and instruction with an emphasis on TESOL. Designed for full-time, working educators who hold a Kansas teaching license, the program prepares students to take the Praxis exam and earn an ESOL endorsement. Newman uses an eight week schedule for each course, divided into two blocks within the semester. Graduate students can complete their degree in as little as eighteen months. Newman's MSED in TESOL program consists of 33 credits, including coursework in cultural diversity, advanced curriculum methods, ESOL assessment, and leadership coaching techniques. Graduate students may fulfill six credits through one of two elective courses, and must complete a fieldwork-based practicum prior to graduation. Students must maintain a minimum cumulative 3.0 GPA at all times. TESOL program applicants must hold a current Kansas teaching license and a bachelor's degree. Along with official transcripts, they should a statement of teaching philosophy and two online letters of reference. With departmental approval, incoming students may transfer up to 12 credits of graduate-level coursework. This Catholic university is accredited by the Higher Learning Commission, and its School of Education is accredited by the National Council for Accreditation of Teacher Education, in partnership with the Kansas State Board of Education. Southeast Missouri State University ranks among The 25 Best Online Master's in English Language Learning Degree Programs! Southeast Missouri State University is part of the Missouri University system, and has offered an online master of arts in teaching English to speakers of other languages degree since 2008. Emphasizing practical application of theory in the classroom, this accredited program prepares graduates to work with students of all ages, in the United States and abroad. SEMO's TESOL master's program requires 36 credits of coursework that addresses concepts in sociolinguistics, ESL educational theory, principles of language, and special problems in TESOL. Students can tailor the 9-credits elective requirement to their personal goals and interests through courses in composition, literature, and foreign languages. The program's practicum component consists of hands-on study in a local school or adult education setting. SEMO's program operates on the semester schedule, with courses available in the summer. Prospective students must submit official transcripts from all colleges and universities they have attended, as well as proof of citizenship or lawful presence in the United States, and a completed application. A minimum cumulative undergraduate GPA of 2.5 is required. Following admission, students meet with an academic advisor each semester to monitor their progress. Tuition is the same for in- and out-of-state students. Cornerstone University ranks among The 25 Best Online Master's in English Language Learning Degree Programs! Located in Grand Rapids, Michigan, this Christian institution's master of arts in teaching English to speakers of other languages is designed to prepare students for missionary work, in addition to ESL teaching positions at all educational levels. Presented in a synchronous format, many students earn a master's in ESL in around 24 months. The TESOL MA is offered in fully-online and blended formats. Students pursuing the fully-online track must attend two approved TESOL conferences or seminars during their coursework, while the blended program requires two one-week residencies on campus. Both consist of 33-credit curricula, with core courses addressing issues in TESOL and TESOL methodology. The program culminates in a capstone project, which may be a written thesis or a 60-hour teaching practicum. In addition to official transcripts from all prior colleges and universities, prospective students should submit two letters of recommendation and a resume with their applications, and hold a mandatory minimum 2.7 GPA in undergraduate coursework. Incoming students Applicants who speak English as a second language must demonstrate English proficiency through sufficient TOEFL scores. Admissions are conducted on a rolling basis, and cohorts start periodically throughout the year. Cornerstone University is accredited by the Higher Learning Commission and the Michigan Department of Education. Mercy College ranks among The 25 Best Online Master's in English Language Learning Degree Programs! This private, non-sectarian college in Dobbs Ferry, New York offers an online master of science in teaching English to speakers of other languages consisting of two tracks. Candidates who have completed New York's 15-week required student teaching experience may pursue Track I, while Track II is intended for professional candidates with 20 days of clinical practice experience in an ESL Pre-K-12 school. Track I students must complete 36 credits of coursework, spanning topics such as education in today's schools, teaching English as a second language, theory and practice of bilingual education, and writing instruction. Track II consists of 33 credits, and includes studies in linguistics and language development, child and adolescent literature, and cultural perspectives on teaching learning processes. Both tracks include a practical teaching component, which online students typically complete in nearby schools. To graduate, students must maintain a cumulative 3.0 GPA. Applicants must submit an official transcript for review and fulfill numerous prerequisites, including 12 credits of college-level foreign language study and an undergraduate major in a liberal arts or science field. TESOL master's program graduates typically teach in K-12 schools, at English language institutes, or work for corporations. Mercy College is accredited by the Middle States Commission on Higher Education. Any graduate degree in teaching prepares you for a variety of careers; you are not limited to teaching. Experience with second-language learning is an especially valuable skill in today's culturally and linguistically diverse workforce. The careers below are just a few examples of paths that graduates of TESOL master's programs can pursue. Instructional Coordinators: Instructional coordinators work at all levels of education, from primary to postsecondary. They create instructional material and curriculums, oversee their implementation, and evaluate their effectiveness and while making necessary adjustments. They may work in a specific school district, for an independent education company, or for the government. School and Career Counselors: Advanced training in TESOL prepares you to work among students with diverse backgrounds and needs. School and career counselors guide students of all levels and backgrounds to meet their academic and career goals by graduation. These counselors generally work in secondary schools, but some may find employment in postsecondary institutions as academic advisors. Postsecondary Teachers: A master's degree may qualify you to teach in higher education, particularly in community colleges. As a TESOL-qualified instructor, you have the unique qualification to work with students who may need extra help in their English-language speaking coursework. You may also teach English specifically to groups of these language learning students.